Chocolate Toffee Crunch Popcorn - Lovely Etc. 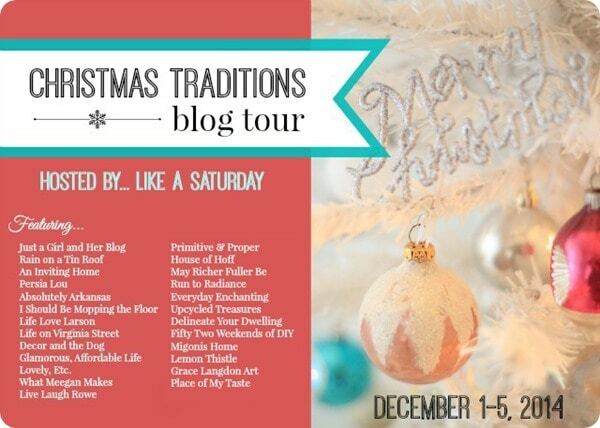 I am thrilled to be sharing one of my favorite Christmas traditions today as part of a a Christmas traditions blog tour, hosted by Rachel from Like a Saturday! Traditions can be really hard sometimes. I love, love, love the idea of traditions and the comfort and joy they bring. But most traditions involve doing certain things at certain times – and that is really tough for our family. My husband doesn’t have a Monday-Friday 9-5 kind of job. He often works late and on weekends and even on holidays. Which means traditions like decorating the tree the day after Thanksgiving or going to the Christmas parade together just don’t work out the way I would like. Inevitably, as soon as we get a tradition started, something seems to come up to derail it! But there is one tradition we never miss, year after year – making this delicious chocolate toffee crunch popcorn! You just can’t go wrong with food, especially special treats! There are certain treats I make every single year at Christmas – preacher cookies, peppermint bark, muddy buddies. Even though we could eat them any time of year, for us they mean Christmas and that is the only time I make them. And of course I like to make a little extra to give as gifts. Throw some in a cute mason jar with some Christmas ribbon and you have a perfect inexpensive neighbor gift. Pop the popcorn in the microwave. Pour it into a couple of large bowls. 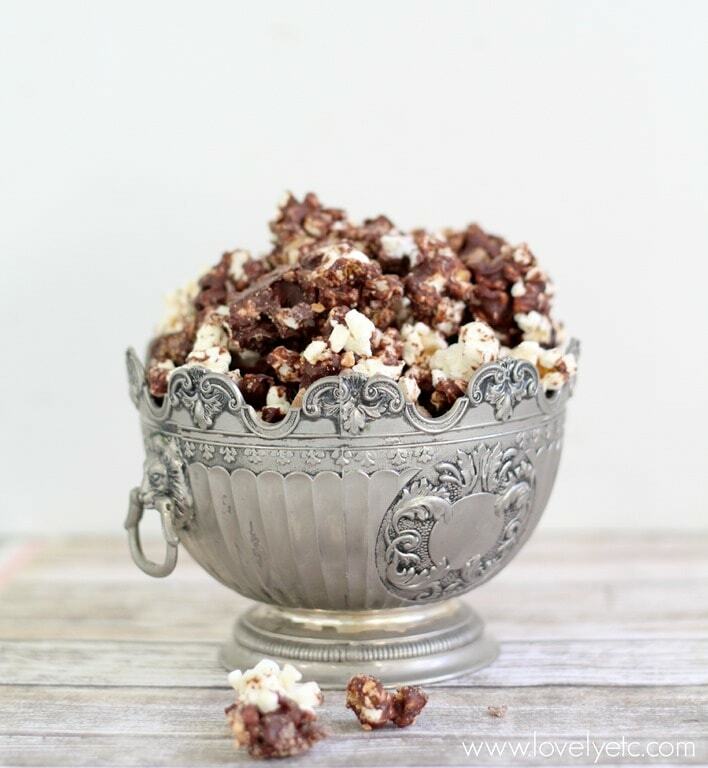 Be very careful to remove any unpopped kernels at this stage – once they are all covered in chocolately goodness, they become impossible to spot and we don’t want anyone cracking a tooth! 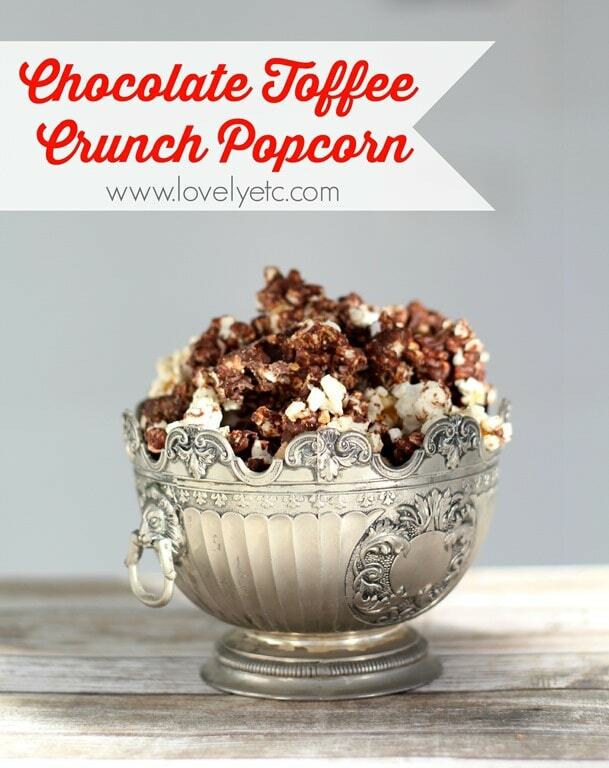 Chop half of the butterscotch chips in a food processor and add these and the toffee bits to the popcorn. Place the chocolate chips and the other half of the butterscotch chips in the microwave. Microwave them for three minutes or until melted, stirring every thirty seconds. Cover a couple of cookie sheets with waxed paper and pour the popcorn mixture onto it. Let it cool for a few hours. Once the chocolate has fully hardened, break the popcorn into pieces and store it in an airtight container. I am linking this post at Christmas Sweets and Treats. oh yum! 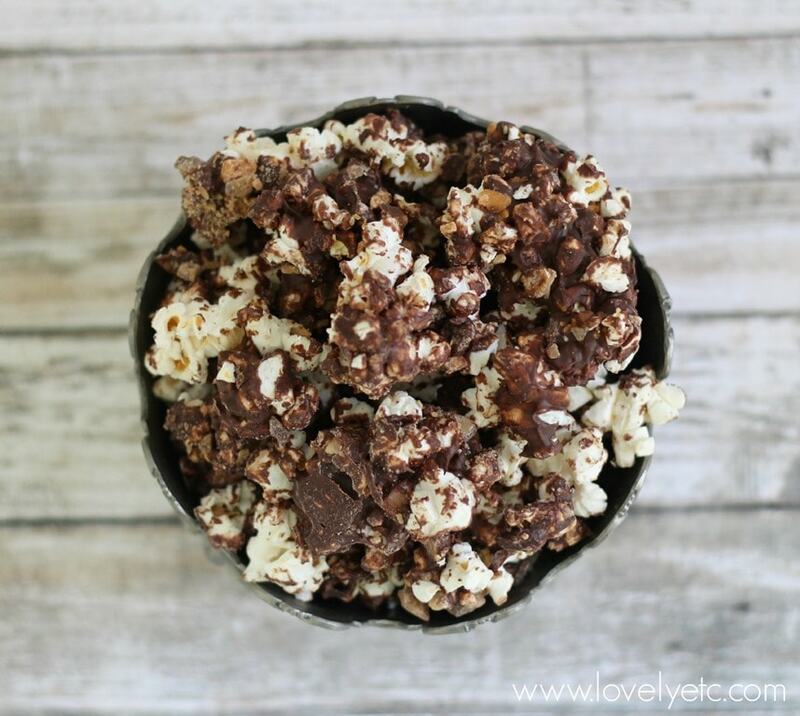 we had friends who gave us toffee popcorn every year and it was the best! i miss it- it was in our old neighborhood! Yum, those sound like the best kind of friends to have! My mouth is WATERING. DELICIOUS! What an awesome neighbor gift this makes, too! Thanks for sharing the delicious recipe! Thanks Kylie! It really is delicious! Oh.my.goodness. This sounds so good! I just might make this for the neighbors! Thanks Rachel! If you do, I know they will love it! Haha! I would send you some if I could! Thanks Chris! Of course the bowl was another yard sale steal! Heath is my absolute favorite candy bar! Pinning! Thanks Andrea! Heath is definitely the best! Thanks Sarah – that sounds delicious too! This looks sooooo yummy and I love the idea of giving it as gifts in mason jars. I also LOVE the container you show it in! Thanks for sharing and Happy Holidays! Thanks Katie! I love that little bowl too – it was a great yard sale find! Yummers! What a tasty tradition! Love it! So glad to be on this tour with you, Carrie!